When I was a little girl, my family lived in New Orleans. We went to a church and we had a worship pastor there named Buster Pray. Years later - when Scott and I were engaged - we went to a big church here in our area where Buster was the worship pastor for years and years and is still on staff. I used to watch his son and daughter-in-law sing on the praise team and though I didn't know them personally - I was so inspired by their talent. I was so sad to hear that this past week - Buster's son Andrew was biking and was hit by a charter bus and killed. Today is his birthday and he would have been 31. He and his wife Courtney have three small children. My heart just hurts so much for Courtney just like it has been for the last few months for my precious friend Julee. I can't imagine being left a young widow and losing the love of your life and your best friend. 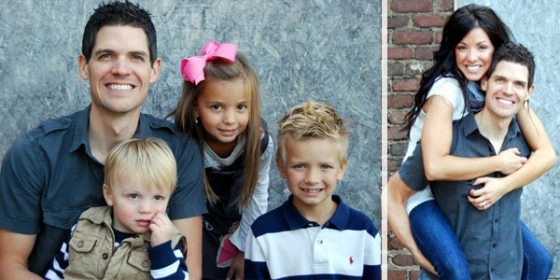 Tomorrow is Andrew's funeral and I'd love for your to pray for this sweet family. Andrew was a worship pastor in Atlanta. I love this article about him - especially the very end. I didn't know Andrew but I have been reading articles and tweets about him this week and I have been SO inspired by him. Person after person after person were tweeting texts that Andrew had sent them. He was an encourager. Every text he sent would say "I'm praying this verse over you" and then list a verse. And almost every text would end with "I'm proud of you and I love you". Andrew is seeing for himself today in Heaven! Andrew had SO much faith and his wife Courtney is amazing me with her strength and faith. I keep thinking about Julee's husband Matt and how at his funeral I was so inspired to be a better person, a better friend, a better mother and wife. I don't understand why these guys have been taken so early. It doesn't make any sense to our little earthly minds. We can't comprehend the mind of Christ. I just want to be that friend who sends my friends Bible Verses and tells them I love them. I want to love my babies well. I want my husband to know he's my hero. I read about Andrew and see his life in action through his texts and tweets and know that his life was short but I can't imagine he would have had any regrets. He served God with everything in Him. He loved well. He made a difference. I've realized this year more than ever before that this life is SO short. We are not promised tomorrow. I want to be more like the Andrews and Matts of this world. Which honestly means - I want to be more like Jesus. I hope you won't go another day without knowing Jesus personally. If you were in a car crash tomorrow or diagnosed with stage 4 cancer - I hope you have the confidence that you would see 1 Cor 2:9 in action - that you would know that you would spend eternity in heaven with Christ. Don't put it off - you never know when you last day will come. And this life is full of good things - but honestly the only thing that REALLY matters is to know Jesus and to make Him known.